Eastern Wyoming College held annual GED Ceremony on May 5th, 2011 at the college. This year’s keynote speaker was Ms. Lynn Wamboldt, Administrative Specialist for Institutional Effectiveness, graduate and alumna of Eastern Wyoming College. There were a total of 123 students who earned their GED this year. From Torrington, WY: Joshua Beckey, Jessica Berggren, Savanna Black Bear, Cheyeann Bennett, James Browning, Lacie Collar, Brandon Cooley, Caroline Cowan-Manus, Halley Craig, Kenneth Essert, Juan Franco, Michael Gillett, Lesley Gunhammer, Amber Hanson, Cheyenne Hatcher, Maverick Hatcher, Shayna Hudson, Roger Jenkins, Thomas Kenyon, Jessica Law, Christopher Manus, Mary Ojeda, Christopher Orsborn, Krista Raffaelli, Nicholas Rife, Amanda Roesch, Alexandria Rosser, Seth Samson, Jennifer Smith, Kristy Thomas, Rebecca Vinton, Ashlee Voshell, Levi Wells, Amanda Wilhelm, William Williford, Vanessa Wise. From Cheyenne, WY: Jennifer Wagner. From Chugwater, WY: Bryn Stinnette. From Douglas, WY: Victor Calballero, Patricia Carr, Clayton Egbert, Trixie Elerbeck, Jason Ford, Jacqueline Freer, Tyler Gatten, Conner Marshall, Randolph Meacham, Tanya Midget, Rachel Moon, Kayla Sheets, Jacqueline Shepherd, Sydney Skaggs, Troy Strock, Tashona Taylor, Charity Vetter, Sharla Weisenberger, Shane Williams. From Evansville, WY: Spencer Hancock. From Glenrock, WY: Eldrin Barrera, Tiffany Beaugureau, Samantha Genoff, Brenda Matthews, Trevor Miller, Justin Nichols, Daniel Rios, Brandy Robinson, Joshua Smith, Jordan Taylor. From Guernsey, WY: Jessica Nyhus, Jeffrey Schultz, Nicolina Troupe, Pennie Wagner. From Hulett, WY: Kalib Brashears, Edward Reynolds, Graham Wickwire. From Lusk, WY: Brendan Barker, Austin Judy, Courtney O’Toole-Edelman. From Moorcroft, WY: Marcel Brown, Trevor Divine, Jason Donner, Isabell Hildreth, Cody Reich, Seth Ruff, Megan Vosahlo, Clayton Wimer. From Newcastle, WY: Angela Bahr, Susan Callison, Mike Carlson, Travis Decker, Kellan Dye, Darshan Patel, Salvador Sandoval, Thomas White. From Sundance, WY: Lance Deinhart, Chandra Pollatt. From Upton, WY: Dakota Adams, Krystin Phillips, Mack Ryan, Christopher Savage. From Wheatland, WY: Taylor Aastrom, Rueben Brunner, Tavia Carter, Melissa Fry, Jessica Gutshall, Brook Isabell-Shifflett, Maria Kauffman, Cody Morgan, Lawrence Norris, Jodee Rosendahl, Connie Sedam, Kaelea Stevenson, Daniel Stivason, Veronica Zipperlen. 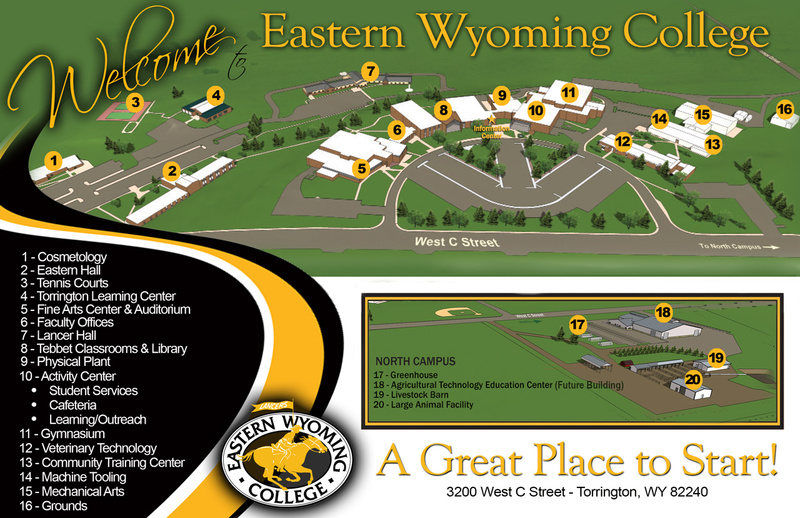 Eastern Wyoming College is pleased to announce the honor rolls for the Spring 2011 semester. There were 288 students receiving recognition for achieving high scholastic grades. Eastern Wyoming College’s Coach of the Women’s Basketball team is anxious to announce the signing of several key players to the Lancer squad. Alexandra Chumulikova, a 5’10” player from Slovakia. She is strong and athletic, a good shooter and very strong fundamentally. Alexandra will make an impact at the small forward position for us. Brittani Colberg, 5’6” point guard from Red Mountain High School in Mesa, AZ. Brittani is a true point who can handle and distribute the ball as well as score. She also is a very good defender and has played with and against very good competition. Alyssa Deal, 5’5” point guard from Cienega High School in Tucson, AZ. Alyssa is a very crafty point guard who can also score in a variety of ways. Alyssa is a very good 3 point shooter and holds her school record in career 3’s, single season 3’s and 3’s made in a game. She also holds her schools record in assists. Jeileen Mas is a 5’7” combo guard from Wiregrass Ranch High School in Wesley Chapel, FL. Jeileen is a very athletic player with great quickness, speed and jumping ability. She is a great defender and can score by getting to the basket as well as a 3 point shooter. Portia McCray is a 5’10” forward from Rockdale County High School in Loganville, GA. Portia combines speed and power into a very strong player. She is strong around the basket as well as in the open court and on the perimeter. Portia will provide both scoring and rebounding. Brianna Pittman is a 5’8” combo player from D’Evelyn High School in Lakewood, CO. The younger sister of Krystal Pittman who played for the Lancers for two years. Brianna is a great outside shooter and has a variety of moves to score around the basket. Her strength inside and her ability to stretch the defense with her shooting range will be an asset. Stephanie Vestnys is a 6’ post player from Paradise High School in Paradise, CA. Stephanie is a strong player who can rebound and score. She will make an impact with her strength and ability to play strong around the basket both on offense and defense. Kortney Lunsford is a 6’ post player who played at Pima Junior College last season. Kortney is a former teammate of Brittani Colberg. Kortney will not only add strength and height to our inside game she will also bring college experience to the post position. Complete information about the Lancer team will be available on the EWC website at ewc.wy.edu. Coach Andersen can be reached at the College at 307.532.8321. Coventry Dougherty-Woodin, Eastern Wyoming College science instructor, has been named a recipient of the Master Distance Educator award for 2011 by the Wyoming Distance Education Consortium (WyDEC). One recipient is named at each community college and the University of Wyoming each year. Dougherty-Woodin was nominated for her dedication to distance education at Eastern Wyoming College. She has delivered General Biology online since she was first hired and serves as a mentor to other distance educators on the Douglas campus. Coventry also served on a task force that designed what is now the Wyoming Distance Learning Center. “I’m amazed at the passion she holds for teaching a rigorous course and at the genuine concern she holds for each her students,” says Aaron Bahmer, Instructional Technologist, who works closely with all instructors who teach distance classes for Eastern Wyoming College. “We appreciate Coventry’s enthusiasm in teaching laboratory sciences for us via distance. These types of classes represent unique challenges, and Coventry meets those challenges and encourages all of her students every step along the way. She is very deserving of this award,” shared EWC Vice President for Learning Dee Ludwig. Dougherty-Woodin attended California State University, Long Beach where she received her B.S. in Biology with a Zoology option in 2005, and her M.S. degree in Biology with an emphasis in Freshwater Systems in 2008. During her graduate education she focused on the quality of streams and rivers using aquatic insects as indicators of stream and river health. In 2008, she joined the faculty of Eastern Wyoming College as the Science Instructor for the Douglas Branch Campus. She teaches courses in Biology, Human Anatomy and Physiology, Environmental Geology and Human Empowerment. Dougherty-Woodin received her award at the WyDEC conference recently held in Riverton at Central Wyoming College. Wyoming taxpayers see a 5.2 percent rate of return on their investment in Wyoming’s community colleges, and the statewide economy sees a total average annual income of $866 million due to the activities of the seven community college districts, according to a newly released report that documents the vital role the colleges play in the economic future of the state and the lives of the 60,000 students they enroll. The results of the economic impact study of Wyoming’s Community Colleges also listed the economic impact of each of the state’s seven community colleges. The impact of the college operations is approximately $10.5 million annually, and student spending is approximately $326,000 for a direct contribution to the economy of $10.8 million. Upon factoring the economic multiplier effect of those funds and subsequent spending by the community, Eastern Wyoming Colleges total economic impact on its service area is $54.7 million. This economic impact represents 2.3% of the total of the service area economy which includes the counties of Goshen, Converse, Niobrara, Weston, Crook, and Platte. EWC President Dr. Tom Armstrong said the report proves that attending college provides more skilled employees who also earn higher wages. “These come back in many ways to a community: additional taxes from qualified workers and fewer individuals requiring other types of appropriate assistance.” Throughout his or her working career, the average EWC student’s discounted lifetime income increases by $4.10 for every dollar invested in EWC. Students enjoy an attractive 16.6% rate of return on their EWC educational investment, recovering all costs in 8.4 years. The study finds meaningful economic impacts for students at Wyoming’s community colleges. Students see a rate of return on their educational investment of 19.3%. For every dollar a student invests in their education they receive a cumulative $5.60 over their working careers. Compared to someone with a high school diploma, associate degree graduates working in Wyoming earn 35% more per year, on average, over the course of a working lifetime. The report also detailed the social perspective of the colleges’ impacts. Higher earnings that accrue to students of Wyoming’s community colleges and associated increases in state income expand the tax base in Wyoming by about $128.3 million each year. Wyoming will see avoided social costs amounting to $4.3 million per year due to students of Wyoming’s community colleges, including savings associated with improved health, reduced crime, and reduced welfare and unemployment. State and local governments allocated $164.9 million in support of Wyoming’s community colleges in FY 2009-10. For every dollar of this support, taxpayers see a cumulative return of $1.40 over the course of students’ working careers (in the form of higher tax receipts and avoided costs). The analysis was largely based on the 2009-10 reporting year, when Wyoming’s community colleges served 37,667 credit and 22,702 non-credit students. In this study, Economic Modeling Specialists, Inc (EMSI) applied a comprehensive model designed to quantify the economic bene?ts of community and technical colleges and translate these into common sense bene?t/cost and investment terms. The study includes two major analyses – Investment Returns and Economic Growth Analysis.